Unity Clothing is one of the manufacturers and exporters of premium quality knitted garments in Tiruppur, India. In 2017, we launched Unity Clothing as a part of Unity division to manufacture and export knitted garments. Even though our company is young, the infrastructure of our organisation combined with our experts helps us maintain edge over our competitions. Our main customers include the brands Medicine, U-Essentiel, House, and Friendship Unlimited from Poland, France and Canada. Our Unity division is the leading distributor of Tajima Embroidery machines in South India and hence, our strong pillar is the in-house latest embroidery machines that are capable of extra ordinary designs in Sequin, Chenille, Cording, Taping, Laser cut and Beads embroidery. Our company also in-house all types of Digital printing machines to print on any type of fabrics and garments. Currently, our production team consists of 350 people and we are constantly striving to develop and upgrade our machineries to the latest technology. We are also committed to keeping our clients at a competitive edge by consistently providing Quality garments at a reasonable price. The growth of any company depends mainly on its infrastructure. Our infrastructure is designed in such a way that it helps us design and tailor different types of products to various customers. 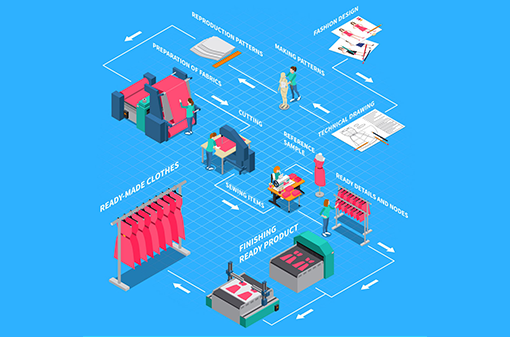 Our infrastructure also allows us to produce quality garments at higher efﬁciency. In order to ease up our production, we have divided our unit based on the process of the garments such as Knitting, Dyeing, Printing, Embroidery and sewing. Our current infrastructure setup is a total of 25000 Sq.feet, that includes sewing unit, embroidery machines, printing machines, fabrication and washing unit. Our factory is capable of producing a range of styles to suit all types of customers. Currently, our production unit has over 100 sewing machines along with additional machines such as Embroidery, printing,.etc Our current turnout is 45 to 60 days from receiving the purchase order receipt.